It's Picnic Time! Please join us next week for our annual picnic in the park meeting! We will be starting at 6:30, please note the time change! Who: PMQG members and their families, friends, visitors. Bring the kids, the hubby, your grandma, it's our annual time to mingle with family! Baby-sitters will be provided (see below for more info). 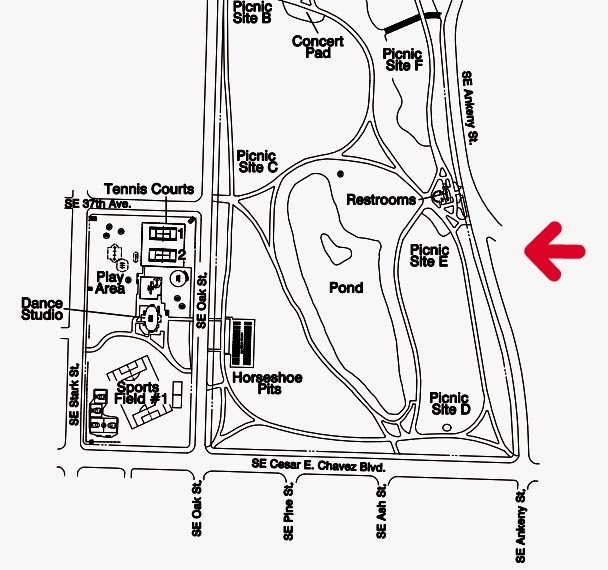 Where: Laurelhurst Park, at SE Cesar Chavez Blvd (39th) and Stark Street, Picnic Site E (on the Ankeny/north side of the park near the restrooms, see picture at end of email). When: Thursday, August 21st from 6:30-8:30. Please note time change! We need to beat the sun setting! 6:30-7:00 will be setting up your picnic area, eating, and mingling. We'll officially start promptly at 7:00. Dinner/drinks for yourself and food to share if you like. Alcohol is allowed if you would like to bring your own. Show and Tell! No need to bring your Medallion this month, we won't be able to hang them up. Monaluna Challenge Blocks! If you ended up not being able to make any blocks, you also need to bring your fabric back. If you made any blocks the extra fabric is yours to keep! What's in store this month? Monica Solaria-Snow will show off her new line of fabric from Cloud 9, Sew Yummy! A representative from our 3rd quarter charity, Raphael House, will be there to talk about their organization. Check out our blog post on Raphael House for more info! A presentation from our August Business Member of the month, Modern Domestic. Feel free to bring your kid/grandkids! There will be baby-sitters provided by the guild to take them over to the playground area. The guild will be paying the baby-sitters, but tips are also appreciated.